One part of the debt ceiling debacle debate that has been agreed to a long time ago is that there will be changes made to inflation calculations. The result will be bracket creep (higher taxes) and a slowing of the rate of benefit payments. I am concerned with this type of thinking. I don’t think it addresses the fundamental problem. The raging argument in D.C. is about something called Long Term Fiscal Solvency. The apparent goal is to slowly reverse the direction of the big ship and ultimately turn it around. Sounds great. The time frame that is being measured is at least 25 years. (It takes a long time to turn a big ship). 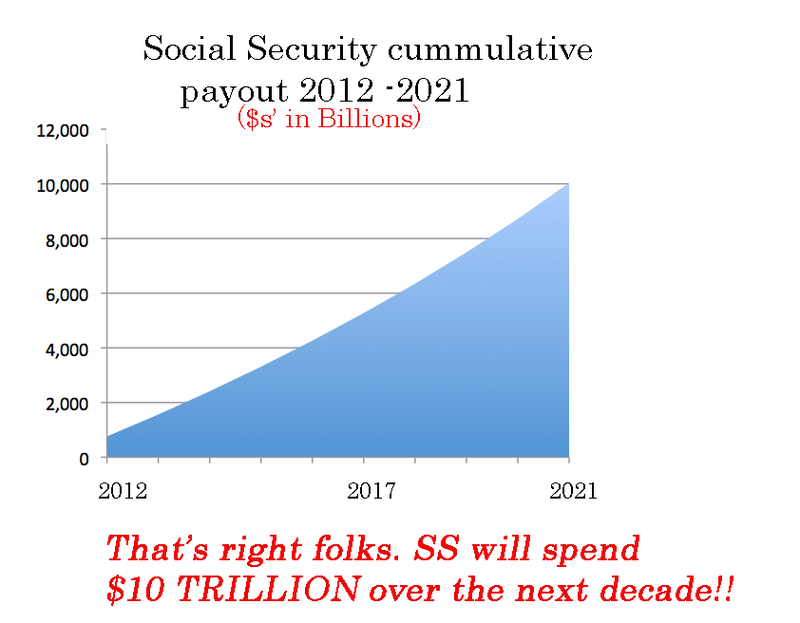 Social Security is a micro component of the budget picture. The“Financial Health” of SS is something that is looked at over a 75-year time period. Some even look at SS based on something called“the Infinite Horizon”. This is crazy thinking. We have no idea what will happen over this time span. The operating assumptions behind all this long-term thinking are that the economy grows at a steady and predictable rate, inflation will remain modest and well below the growth rate. FOR EVER! Call that economic utopia. It will not happen. Note that benefits rise by 70% over this time frame. 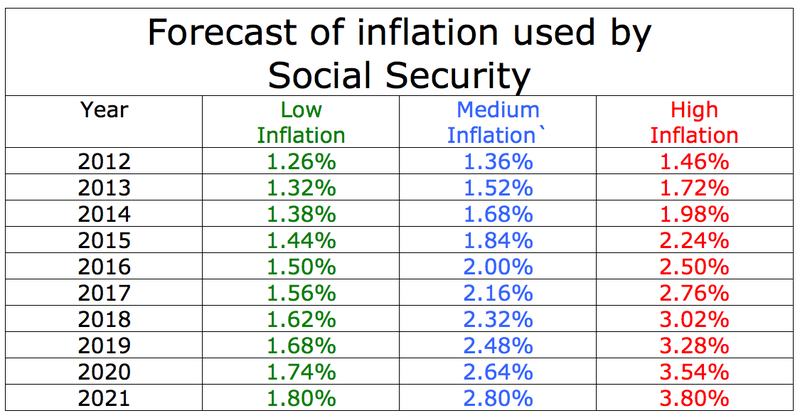 That increase is a result of two components; A) Net new beneficiaries and B) Inflation adjustments. 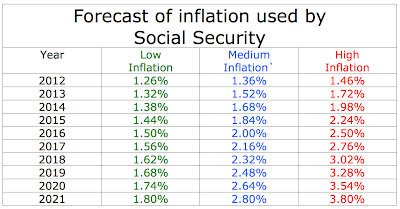 SS has a range of expectations for inflation. They start with the 2011 number and they all increase over the ten-year period. 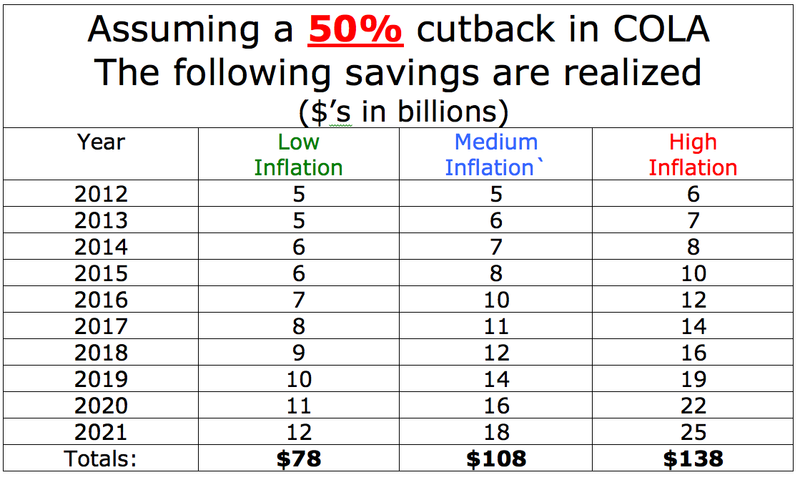 These are the numbers that are built into the SS calculations for inflation. 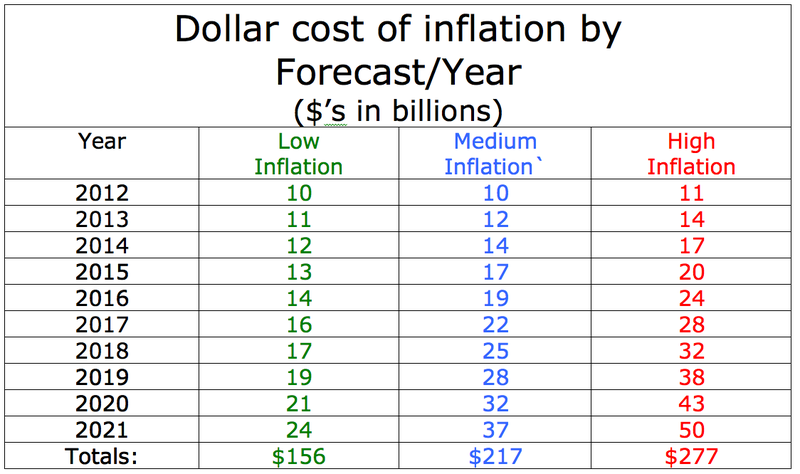 This chart covers the Low Cost, High Cost and Intermediate projections for inflation. 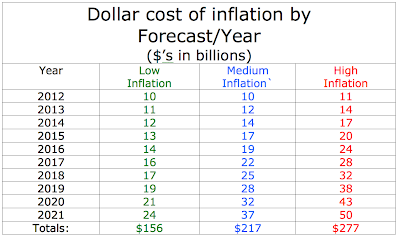 This chart of data looks at what the inflation component is in actual dollars. Consider the conclusions. 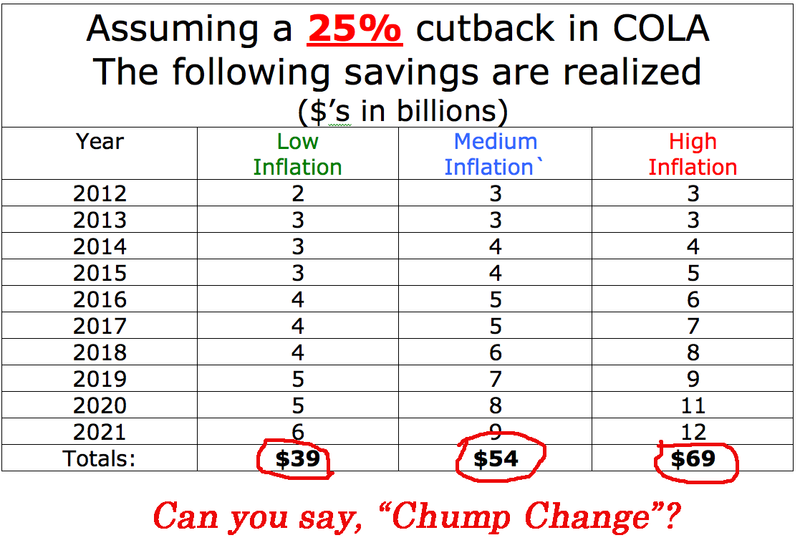 Depending on the actual rate of inflation the savings of a 25% cutback plan would result in very small changes to actual payouts. 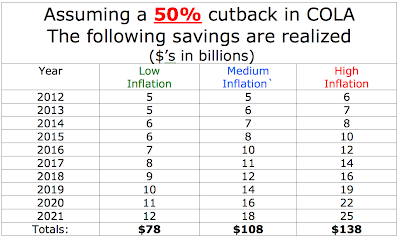 In the SS Intermediate Case the savings would amount to a measly $54 billion over the period. 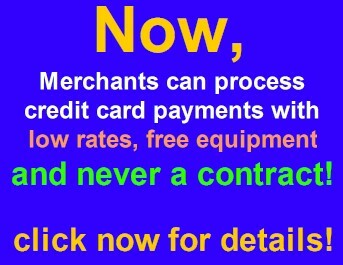 That comes to ½% of total benefits. This is a meaningless result in our big economy. I’m not going to bore you (further) with more charts. I will just tell you that after ten years or so the miracle of compounding comes into play. 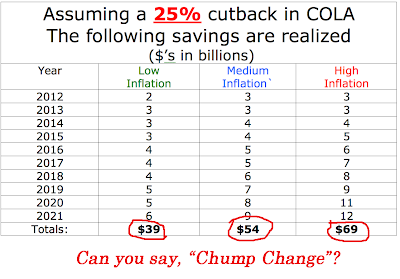 With each additional year the difference between actual inflation and the COLA adjustments will widen. When you extend this type of thinking over long periods of time it does make a very big difference. After 25 to 30 years this would be significant. This “logic” will be presented to us in the next few days. Leaders on both sides will say that they have set a path toward long-term fiscal solvency. 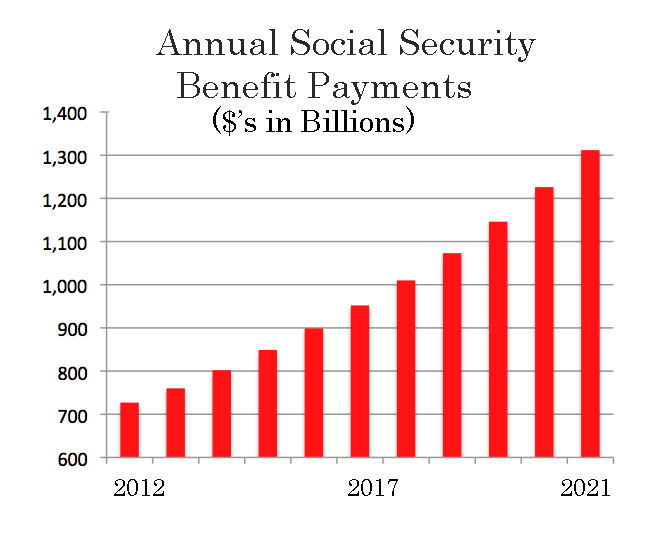 They will show graphs produced by the CBO that support the claim that after fifteen years (or longer) the bend point on benefits is reached. They will be able to show dramatically improved debt to GDP ratios as a result. But all of that “good stuff” will be far into the future. My concern is that we don’t make it through the first ten years. The absence of any significant improvement in the foreseeable future (versus the infinite future) is going to trip us up. It won’t take all that long for the markets to recognize these implications. Any relief rally in bonds or stocks is likely to be short lived. The stock market looks out (at best) six months. The bond market looks longer (not of late); two years is as far as the bond boys can see. Macro economic policy starts with ten years and looks beyond that.The two groups are looking at entirely different playbooks. It’s quite possible that we will see the D.C. crowd showing us one set of graphs and claiming success. At the same time Wall Street will be producing another set of numbers on the visible supply of government debt for the next 48 months. D.C. will be crowing about long-term solvency, while the markets will fret about short-terminsolvency. Ten-years is forever on Wall Street. 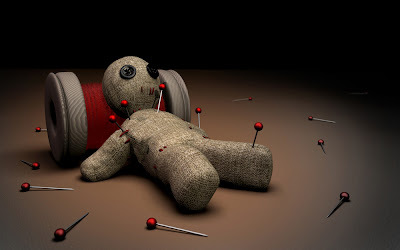 The term “Voodoo Economics” was a popular term that was used to describe “Reaganomics” back in the 80s. I wouldn’t be surprised if that term comes back into vogue.